Better Fuel Efficiency for Classic Cars? Motorheads Performance was honored to interview inventor Frank Will to discuss his Over7TM design, which recently caught the eye of the editors at Popular Science in their search for top inventions for their 6th Annual 2012 Awards. Mr. Will's innovative design uses waste heat to reduce car engine friction by warming the engine oil to its optimal operating temperature, resulting in higher efficiency, lower emissions, and fuel consumption savings! After reading an article in the June 2012 issue of Popular Science magazine, I must admit, something hit a cord. Since I work and live side-by-side with a mechanical engineer, I guess some of the intrigue in what they do has rubbed off on me, and I was immediately curious. The article aptly described Mr. Will's life as having always "been consumed with improving engine performance." In fact, he began racing motorcycles in Europe when he was a teenager. He won a world championship race in 1991 before becoming an automotive engineer with Ford in Germany and later also Australia. Leaving his job in 2008, he began working on what later was dubbed "Over7". I admit, I wanted more information. The concept sure seemed sound. It just made a lot of sense, and a sentence near the end of the article caught my eye. "He also plans to furnish a $200 to $400 conversion kit that mechanics could use to install the system in older cars." Well, I thought...the wheels turning in my head...I wonder how well the system would work on a classic car? It would seem a simple add-on would not detract much from keeping an engine original, as it works by collecting hot motor oil before it returns to the oil pan, instead redirecting it to a heat exchanger that transfers heat from the engine's exhaust gas, heating it even more. This makes it less viscous, at the same time keeping it from burning up the engine due to the thermostat control, which does not allow the temperature to exceed 300 degrees. Amazingly, the actual engine block stays at a relatively cool 200 degrees, making it easier to turn the crankshaft and run the oil pump, thereby requiring less fuel from the engine. While this system may not work well in a performance engine that our customers use for their street/strip muscle cars and classics, I'm thinking this could be a good thing for our classic car customers that have daily drivers, or regularly use their cars for cruises, etc., where gas mileage can be an important consideration! By this time, my mind is racing ahead of itself. How easily would this conversion kit be to install? Would a "one size fits all" system work, or would there need to be modifications for different size engines, etc. The questions began flying, and before you know it, I was contacting the inventor, Mr. Frank Will, at Deakin University in Geelong, Australia, where he has led research and testing at the School of Engineering during his Ph.D. project! I was astonished and pleased to receive a quick, personal reply from Mr. Will. He not only answered my questions, but engaged in a back and forth dialogue where I found out that, yes, Frank IS an American Classic Car enthusiast! While a friend has "an old Mustang", his dream car would be "the yellow hot rod from American Graffiti". Well, Frank, you are in good company! A NICE pick! I know our friends and customers at Motorheads are nodding their heads in approval. Earlier, I alluded to the efficiency of Over7. In fact, tests have indicated that its use can cut gas consumption by 7 percent, and emissions by up to 30 percent, which is a big savings. Research has found that a typical car engine wastes about 80 percent of its fuel, with only 20 percent of the fuel's energy being used to actually drive the car forward! The rest is lost as heat. Mr. Will's Over7 appears to address this waste. Mr. Will explained, "One of its most important features is that it doesn't have to heat all the oil in the sump. Instead, it heats only the active oil in the engine lubrication system. This makes the overall heat transfer process much more efficient. Other benefits include the potential to reduce engine wear and improve performance." Motorheads: What caused you to look at engine oil as a possible way to improve efficiency? Mr. Will: Around ten years ago some articles were published about exhaust gas heat exchangers to warm up the coolant faster. I thought that's a great idea and that it also should improve fuel economy, but it didn't. So I asked myself why and did some analysis and concluded that most of the heat transferred from the exhaust to the coolant doesn't really make it into the oil as it is lost to the ambient air. So I thought why not heat up the oil directly and performed some tests that showed some encouraging results. However, some of the results didn't make sense to me so I looked further into it and came up with the new systems specification. Motorheads: Being a performance shop, we love the idea of lowering the heat in an engine block. Will the Over7 work on classic cars and trucks as well as modern day vehicles? Mr. Will: Yes, it will but mostly during day to day driving where the oil doesn't really get warm enough. On the race track of course it's a different scenario where you want to keep the oil temp below a certain limit, similar when you tow a trailer up the mountains in summer. Motorheads: Will conversion kits be available at any time in the near future for shops like ours to install for customers? Mr. Will: I hope so and I'm looking into it. At the moment I'm running some further tests with different configurations to determine the detailed business case. And I'm looking for a large partner with the relevant market access. However, my main focus at the moment are engineering projects with car manufacturers as they are under a huge pressure to reduce the CO2 emissions of their future cars that they are currently developing, cause by new CO2 emission regulations that are currently being introduced in most parts of the world. The system has the potential to be retrofitted to existing engines and we don't think it will require big changes. It should be much cheaper to fit than an LPG conversion for example. Built into a new car, it should pay for itself within a month or two. Motorheads: How can Motorheads Performance participate in the testing and installation of these systems? Mr. Will: Interesting question, it might be a bit difficult due to the distance. But I had a look at the parts that you distribute and I found a couple of brands that make some parts that could be used in a conversion kit with some modifications/adaptation. These companies may be interested in the collaborative development of such aftermarket conversion kits which would speed up things a lot. Motorheads Performance hopes to introduce some specific American manufacturers to Mr. Will's Over7 design. We'd love to see if they are interested in working with him on a conversion kit which could be used here in the United States. 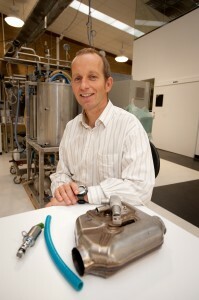 Meanwhile, Mr. Will is currently testing Over7 at emissions labs, and getting his invention ready for others to use. "We were very pleased with the results of tests on our prototype system. Now we are working on further testing with car manufacturers and their suppliers, in order to optimize the technology to best suit their needs." He hopes that Over7 could be in use within six years. 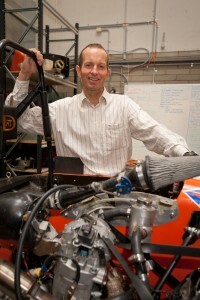 Frank Will has also been recognized for his work on Over7 with a Gold Award by the Society of Automotive Engineers Australasia (SAE-A), and was one of sixteen Fresh Science winners in 2011, a national program for early-career scientists sponsored by the Australian Government in order to present their research to the public. We'll be excited to see how this project develops! Photos in this article first appeared on freshscience.org and have been reprinted with permission from Mr. Frank Will. About the Author: Andrea is co-owner of Motorheads Performance, a classic car performance and restoration design shop in Leesville, Texas. Motorheads specializes in cars and trucks from the 1920's through the 1970's. Their job is bringing old cars back to life for their customers. Guy L. Algar is the Shop Manager. He holds 5 ASE certifications from the National Institute for Automotive Service Excellence (ASE), and is a Mechanical Engineer with over 25 years of design, installation and troubleshooting experience.